Watch how Manitoba Hydro crews de-ice lines by melting, rolling, and smacking ice and hoarfrost off. De-icing prevents outages, damage, and public safety hazards.Ice weight can put a lot of stress on power lines and damage equipment. Snow, rain, or freezing rain can also create conditions to start pole fires. A controlled short-circuit is placed at one end of a line. The current flow creates a temperature increase that heats up the line and melts the ice. 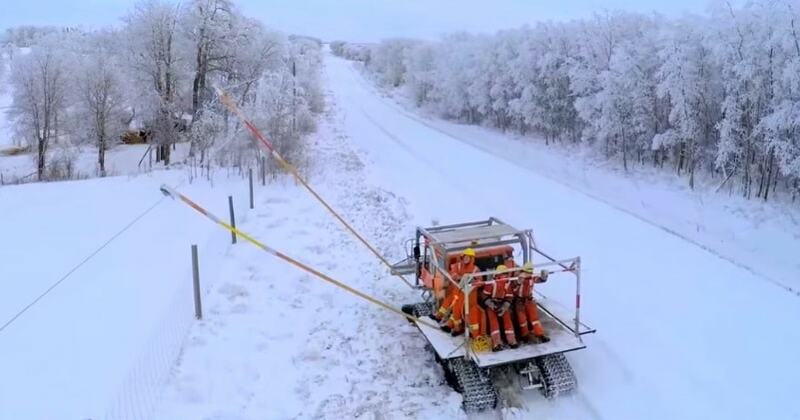 A 2 crews of 3 to 4 people each (one crew working outside on the equipment and the other crew working in a control room), we can melt the ice off 30 to 50 km of line in about 3 hours, often with no customer outages.